The teaching and learning of English at Reigate Priory is organised into three areas which transfer to learning throughout the curriculum; reading, writing and spoken language. Use a range of strategies, including accurate decoding of text, to read for meaning. Understand, describe, select or retrieve information, events or ideas from texts and use quotation and reference to text. Deduce, infer or interpret information, events or ideas from texts. Explain and comment on writers’ use of language, including grammatical and literary features at word and sentence level. Identify and comment on writers’ purposes and viewpoints, and the overall effect of the text on the reader. Relate their texts to social, cultural and historical traditions. Vary sentences for clarity, purpose and effect. Writing with technical accuracy of syntax and punctuation in phrases, clauses and sentences. Organise and present whole texts effectively, sequencing and structuring information, ideas and events. Construct paragraphs and use cohesion within and between paragraphs. Write imaginative, interesting and thoughtful texts. Produce texts which are appropriate to task, reader and purpose. Select appropriate and effective vocabulary. Use correct spelling across their writing. Write in a legible style, with accurate and consistent letter formation and joins. Speak clearly, fluently and confidently to different people. To listen, understand and respond to others. To join in as members of a group. To participate in a range of drama activities. A positive attitude towards mathematics and an awareness of the fascination of mathematics. Competence and confidence in mathematical knowledge, concepts and skills. An ability to solve problems, to reason, to think logically and to work systematically and accurately. An ability to communicate mathematical thinking, ideas and processes. An ability to use and apply mathematics across the curriculum and in real life. An understanding of mathematics through a process of enquiry and experiment. Retain and develop their natural sense of curiosity about the world around them. Draw conclusions themselves through self- discovery and experiential learning opportunities. Make connections between the Science all around us and other areas of the curriculum. Come to understand the nature of "scientific method" and take care when observing testing and evaluating evidence. Become effective communicators of scientific ideas, facts and data using appropriate scientific vocabulary. Children are involved in designing, constructing and evaluating projects using a range of materials such as wood, card, fabric and food ingredients. Through all D.T. learning, children are encouraged to make connections with the real life applications of their skills and communicate their thinking clearly. 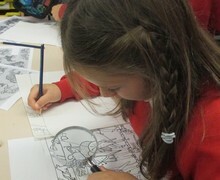 Our budding geographers learn to observe the world around them and make enquiries based on their observations. They collect and record evidence which they interpret and connect to previous learning or real world examples. Children develop the ability to describe and explain their geographical understanding. Historians need a natural sense of curiosity and a desire to enquire and this is exactly what our children have. They also learn to order key events and people in history, interpret evidence and explain and communicate their findings. We are very lucky to learn in a unique grade one listed building which a rich and varied history over many centuries which supports our children to understand the impact of history upon their own lives in 21st century Britain. Artists need to explore and investigate so that is exactly what we encourage. We support our children to practise their skills, take a risk with their art and communicate their opinions and feelings about, and through, art. We aim to prepare children for a fast changing world of technological advances. They learn to explore and use a range of software and devices before applying their learning in projects they plan and debug for themselves. Underpinning all computing learning is a focus on being safe both physically and emotionally in the digital world. We introduce pupils to other languages and cultures, specifically French, in a way that is enjoyable and fun. The emphasis is on spoken language so children listen carefully and have a go at speaking words and phrases building to short conversations. As they become confident speakers, they will learn to read and write another language accurately. We foster understanding, sensitivity and enjoyment of music as individuals and as part of the whole school community through active involvement in performing and composing, listening and appraising. 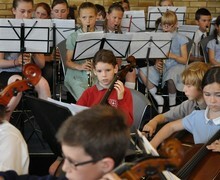 Our school choir and orchestra meets on a weekly basis and perform in public to the local community. Children have the opportunity to see performances of a variety of musicals. We have recently seen ‘Joseph’, ‘Showstopper’ and ‘We Will Rock You’. Tuition in brass, woodwind, string instruments, percussion and singing, for which there is a fee, is provided by members of the County Peripatetic Staff. Instruments are available on free loan or hire for three months to encourage budding talent. 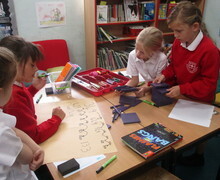 PSHE learning runs like a thread throughout the curriculum and wider school life. 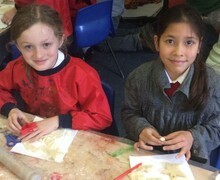 Children learn through a range of discrete, cross curricular and extra-curricular experiences about themselves and those they share their community and the wider world with. They learn to respect themselves and others as important individuals in society with responsibilities in relation to their health and economic wellbeing. They are asked to respond to a variety of views and situations and be prepared to “risk-take” responsibly in order to broaden their horizons and improve their outcomes. SRE is a combination of Science and PSHE learning that enables children to understand the key differences between the genders and the human life cycle within the context of growing responsibility as they mature and positive social relationships. Parents are notified by letter and invited to view the content of this section of work prior to its commencement. Parents may withdraw their child from the PSHE aspects of this programme according to Government guidelines. Please note that withdrawal requests must be put in writing. RE is taught from the Surrey Agreed Syllabus and lessons offer a chance to learn about the beliefs and practices in six different world religions and belief systems. Children have the opportunity to reflect on their experiences and empathise with those of others. They also investigate religious beliefs, practices and artefacts, interpret their meaning and make links between faiths. Children are encouraged to debate ideas and express their views sensitively within a supportive atmosphere. Visits to places of worship, handling artefacts and visiting speakers enhance children’s understanding of our multicultural society and aid community cohesion. Parents may withdraw their child from any aspects of this curriculum, including collective worship, according to Government guidelines. Please note that withdrawal requests must be put in writing. Children receive 2 hours of P.E. per week. Children develop the skills and strategies to play football, basketball, cricket, netball, hockey, rounders, stoolball, tag-rugby, volleyball and athletics. Children learn how to prepare their bodies for exercise and evaluate their performance. Our gymnasium is purpose-built, spacious and well-equipped for activities such as gymnastics and movement. There are many sports clubs and teams, and outdoor and adventurous activities allows children access to map work, fieldwork and residential visits. 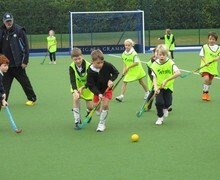 The Redhill and Reigate Primary Schools Sports Association organises competitions, leagues and tournaments for many sports, in which we participate.